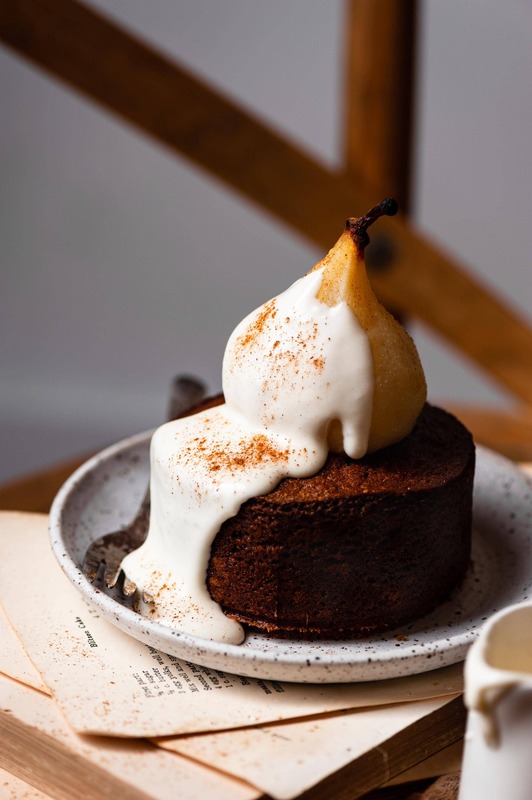 Cardamom Cakes scream fall to me, especially when its paired with Poached Pears and Maple Cream. I’ve been waiting for the first leaf to fall so I could start baking with Autumn spices. The calendar may say early September and it may still be hot outside, but its all spices and pears in my kitchen. This recipe is a slight adjustment from what I had planned to make. For the past two years I’ve been making this cake as a loaf with the whole pears baked in a row down the center. Everything looks beautiful and taste delicious. However, if you so much as attempt to lift the loaf cake, those pears want to fall right through. (heavy little suckers!). I found the initial look to be appealing, though its function not so great for serving. Modification here we come! 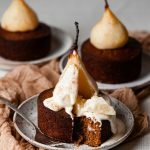 I’m planning to make a dessert for a family holiday get together later this year and I thought, what would look better…a sad little slice with part of a pear, or your own personal mini cake with a whole pear and extra maple cream? Ding ding, we like personal desserts in my family!! 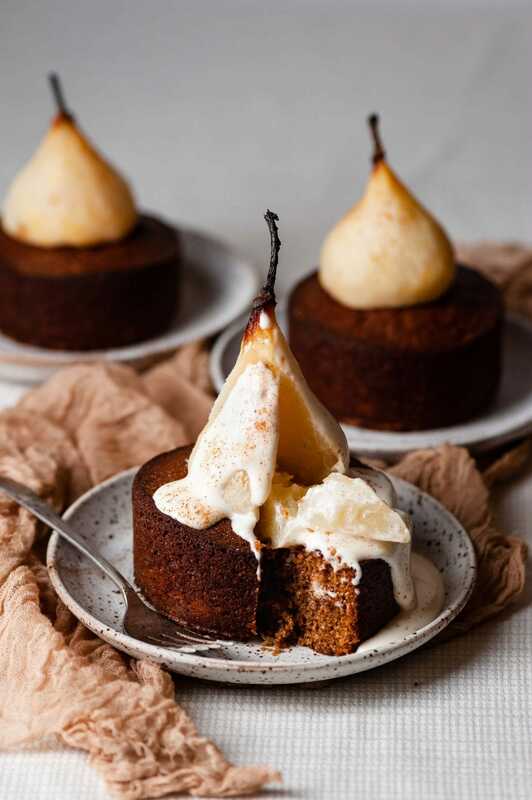 Hence the creation of the Mini Poached Pear Cardamom Cakes. I’m now armed for future holiday battle with a tasty and beautiful spice cake. Choose pears equal in size and not super large with beautiful stems. Peel your pears leaving the stem intact. Once the wine has started to bubble and the sugar is dissolved, let your pears simmer for about 30-40 minutes. Gently remove from the pot with a slotted spoon and set on a paper towel, stem up to absorb any extra runoff liquid. Use three mini 4 inch spring form cake pans or regular 4 inch cake pans. Whip eggs and sugar together until fluffy before adding to flour mixture to create a smooth batter. 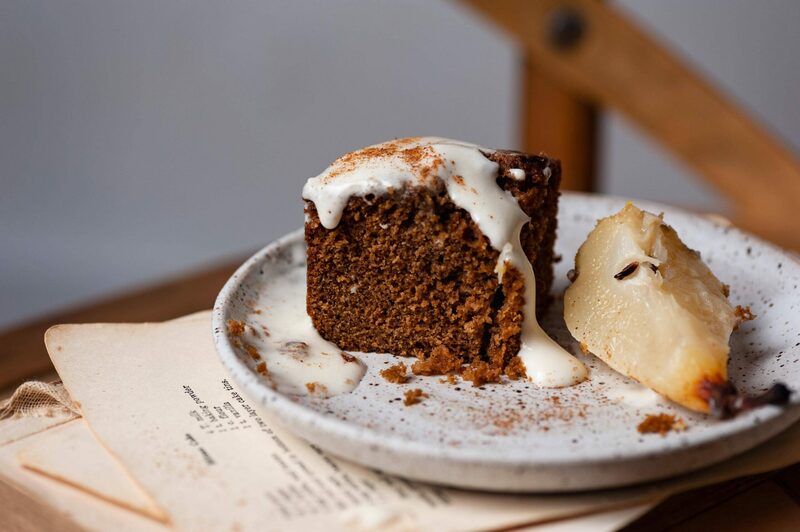 Adjust the amount of cinnamon and cardamom to your personal spice level preference. Let cakes cool in tin 10-15 minutes before removing. Cake tops can be cut while still warm once removed from tins. Take a 1 1/2 inch biscuit cutter or cookie cutter to remove a 1/4 -1/2 deep circle from the top center of each cake. I press just enough to cut the shape of the circle and then remove gently with a spoon. 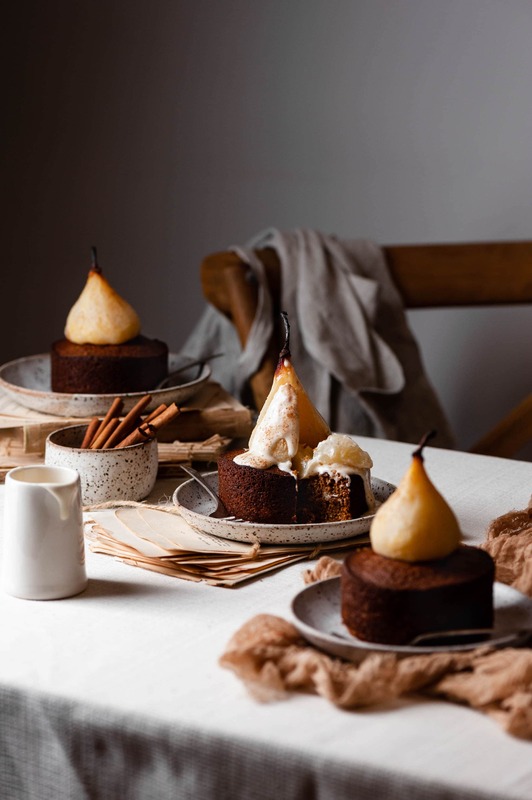 Take out just enough cake for your pear to rest comfortably on top. Make sure your cream cheese is room temperature to prevent clumping. Beat the cream cheese vanilla and maple syrup together on medium high speed until smooth and creamy. Add powdered sugar slowly and beat until thick frosting is formed. Pour almond milk while on medium speed and whisk until desired consistency. 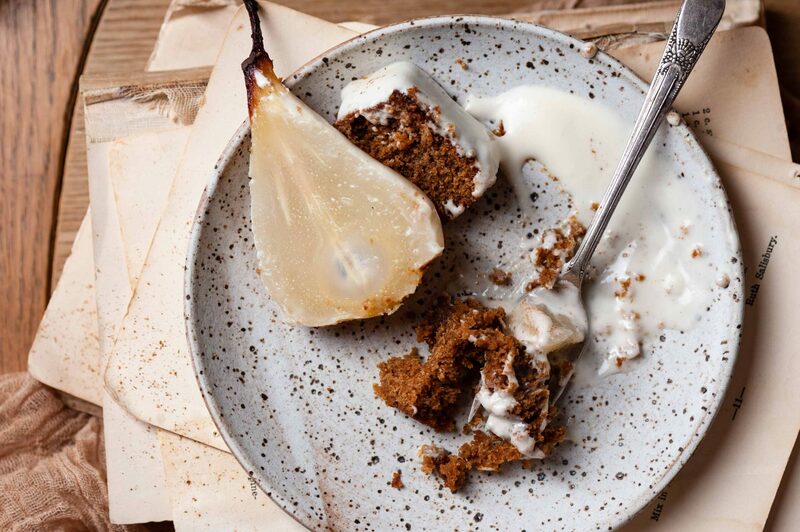 Pour maple cream onto over the pear and sprinkle a dusting of cinnamon and/or nutmeg. 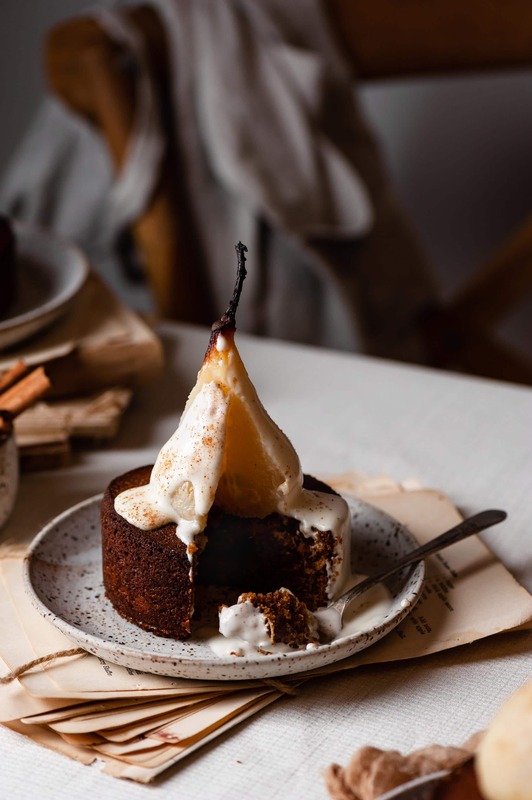 Mini Poached Pear Cardamom Cakes are full of spice, topped with cinnamon and white wine poached pears, with a pour of Maple Cream Sauce. Prepare Cakes and put in the oven first. 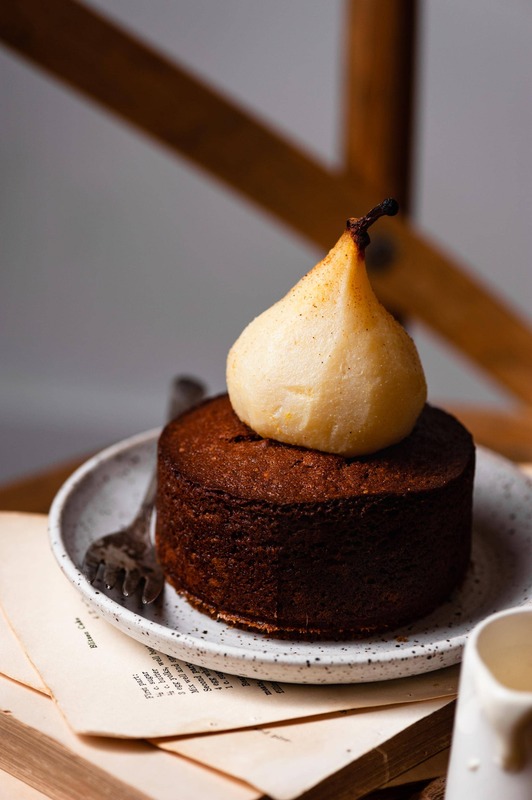 While cakes are baking poach your pears. Once cakes are out of the oven and cooling, make your Maple Cream Sauce! Preheat oven to 350 F (180 C) and prepare three 4 inch cake pans with baking spray. In a small bowl, melt the butter and add to the milk, set aside. Combine flour, baking powder, salt, and spices in a separate large bowl and whisk together. Using bowl of stand mixer with whisk attachment on medium high speed, beat the eggs with the sugar until the mixture is thick and frothy. Pour the frothy egg and sugar mixture into the flour mixture. Then stir in the milk and butter. Using a whisk gently combine all ingredients. Divide the batter amongst the three cake pans. Place the three small cake pans on a cookie sheet. Remove cake pans from cookie sheet and set onto cooling rack. Place each cake with center hole on a serving plate. 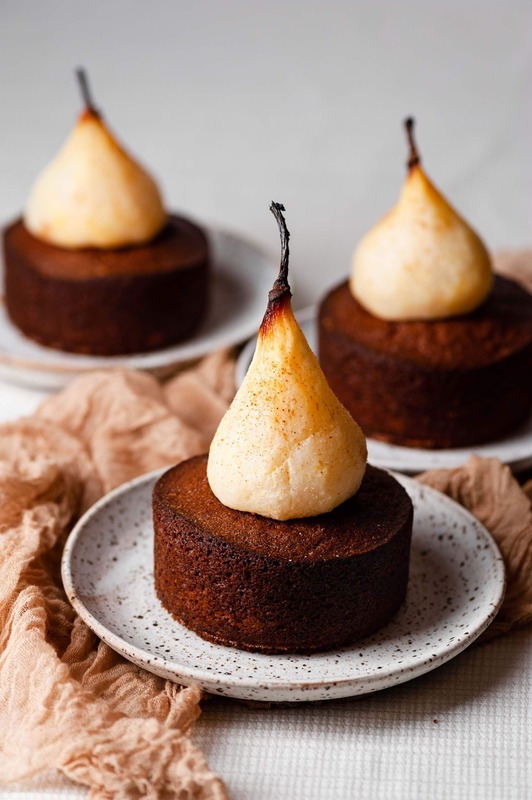 Gently set a poached pear onto the center hole of each cake. Pour Maple Cream Sauce over the pear and sprinkle with cinnamon and/or nutmeg. Peel Pears leaving the stem intact. Using a medium sized sauce pot pour in water, wine, and sugar. Add in cinnamon sticks and pears. Bring liquid to a soft boil until sugar is dissolved. (stir gently with wooden spoon, do not damage pears). Once sugar is dissolved, turn temperature down to simmer and let sit for 35-40 minutes. Place cream cheese, vanilla, and maple syrup into the bowl of stand mixer with whisk attachment. Beat on medium high speed until smooth and creamy. Slowly spoon in powdered sugar until a thick frosting forms. Pour in milk while on medium speed and mix until desired consistency. These mini cakes looks amazing!!! and the pictures are fantastic! really give a feeling of visiting you in your warm home!!! These cakes are truly gorgeous and i’m sure they taste just as good! 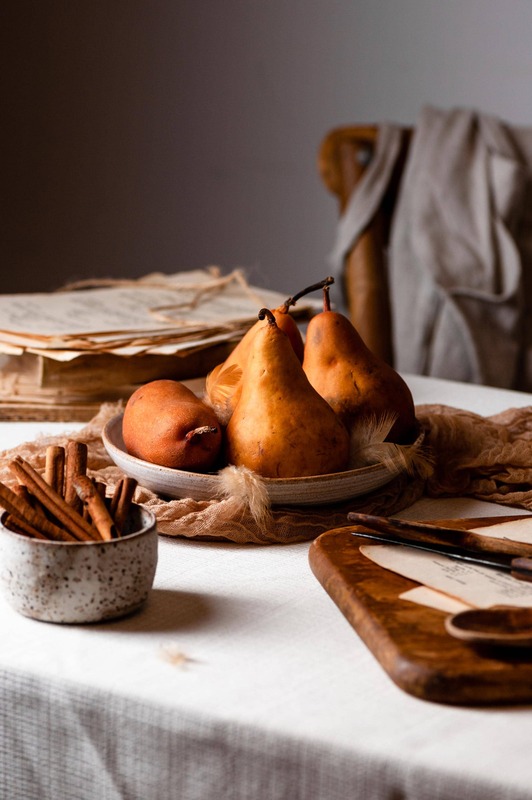 Loving the photography and mood you put into your recipes – a truly beautiful blog!